EX715Ag — SCENAR and COSMODIC — “LET Medical” Research Lab. This is the first EX model which was endowed with OLED display. Its sophisticated design allows anyone operate the device easily. Even battery replacement is like opening a jewel-box — all you need is press the little button. Regulation of action energy level is now performed automatically. The EX715Ag automatically switches to the more delicate impulse for action upon mucous membranes (when you work with vaginal and rectal electrodes). The graphics in area search mode are simple to follow and easy to understand. The menu allows you to set the user’s functions, in Russian and English. With this model you can enjoy the benefits of 2 treatment and massaging modes which can be used for cosmetology. The quiet mode is implemented for the first time: you switch-off sound and activate vibrosignal to indicate the reaction. Now you can treat yourself during a staff meeting or in a theatre without disturbing anyone (a toothache or headache may bother you anywhere). 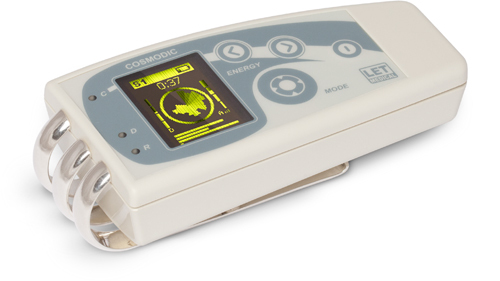 This device is the first one which implements COSMODIC technology in full. Originally EX715Ag was intended for women and even after all improvements it inherited the “female” personality — tender, caring, elegant, sensitive and sometimes capricious. However, it is popular among both men and women. In a family circle of “LET Medical” this model is called “girlie”. Functional and technical abundance enclosed in a compact and ergonomic casing make this device one of the best for personal use. If you wish to broaden the limits for your health and well-being, a top device for yourself, this is what you need. Treat yourself beautifully! EX715Ag is an exclusive model employing COSMODIC technology. Intended for personal use. Completely automated treatment process and basic parameters. timer of action upon the area, timer of the whole procedure, timer of the resource of the device. shows action modes, action energy, activity of the area being acted upon, dosage, time of action upon the certain area and full time of action, menu, and battery charge level. Allows you to approximately define appropriate areas for action, activation of dynamic adaptation block and proper contact of the electrodes with skin. The device is encased in a handy and ergonomic “Smart” casing. Waterproof keyboard and sealants allow easy disinfection and cleaning of the device. The casing is made of shockproof ABS plastic. Two rechargeable batteries or galvanic cells, size AAA, 1.5V.